As part of the 2013 goals and resolutions, I’m working on cooking with ingredients we already have on hand in our pantry and freezer. We purchased a local pig and have quite a bit of pork in our freezer. I needed a recipe that I could do in the slow cooker and this is what I came up with. I cut the pork off the bone for a nicer presentation and it also is better for portion control as we have little kids would could not eat an entire pork chop at this time. 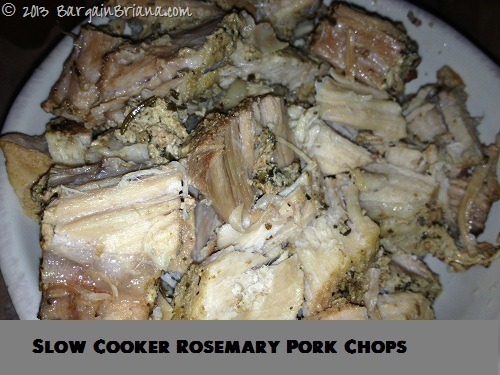 Combine all ingredients except the pork chops in a small bowl. Cut several slits in the pork chops with a knife. Pour mixture over the pork chops. During cooking, baste the pork or pour juice/mixture over the pork. Cook for 4-5 hours or until done in slow cooker on low.